Memories are made in the kitchen, so let us help you create the perfect memory-making space. When you partner with ProSource® of Birmingham, a professional kitchen designer will help you create the dream kitchen you have always wanted — at the wholesale price you deserve. With our expansive selection and design expertise, we’ll make sure you complete your dream kitchen remodel successfully. 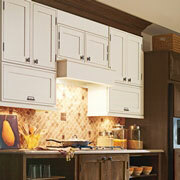 The shape, wood type, and finish of cabinets is what will give life and personality to the kitchen. Come into our showroom to see, and better imagine, any of our cabinets in your space. 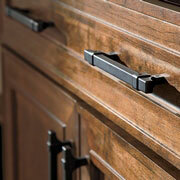 No matter how great the cabinets are, they wouldn’t be complete without some fantastic cabinet hardware. We have everything from traditional pulls to statement knobs, so let us help you get a handle (pun intended) on it and find the right cabinet hardware. 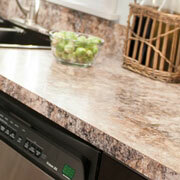 Are you looking for granite, quartz, or perhaps a blended countertop material? We’ve got what you’re they’re looking for. With our collection of countertops, kitchen remodeling project just got more fun. 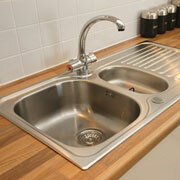 Perhaps a farmhouse sink is just what you want, or maybe it’s an under-mount sink to match the countertops. Whatever it is, we’ve got you covered in a variety of material and color choices. 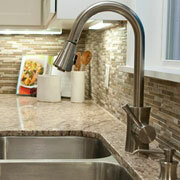 Faucets are for utility, so why not make your kitchen faucet as useful as possible. When you visit our showroom, we’ll show you myriad kitchen faucets that could meet your needs and wants—in numerous colors and styles.